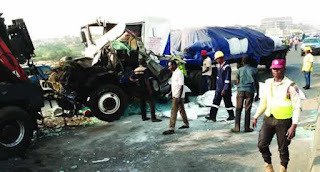 Two persons have reportedly to have escaped death in an auto crashing involving two petrol tankers and a truck on the Lagos-Ibadan Expressway on Saturday. Information gathered revealed that the accident has caused a great gridlock on the road, which made it possible for road users to navigate easily to their various destinations. The Sector Commander of the Federal Road Safety Corps in Ogun State, Mr Clement Oladele, who confirmed the accident said two persons were injured in the accident and have been taken to the hospital for treatment. The FRSC boss warned motorists against over speeding, adding that drivers should always ensure that their vehicles are in good conditions before putting them on the road.